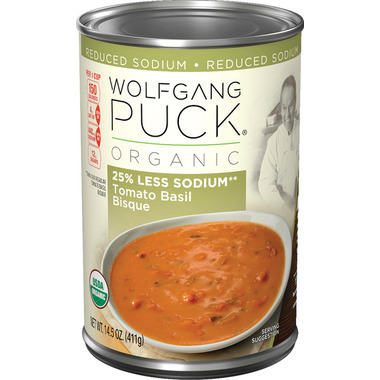 Wolfgang Puck Organic Tomato Bisque Soup is made of 25% less sodium. Garnish with fresh basil and a dollop of creme fraiche or sour cream! 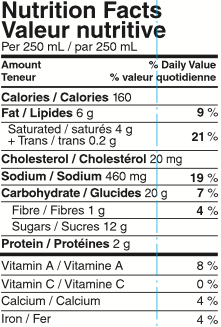 Ingredients: Water, Tomatoes* (Tomatoes*, Tomato Juice*, Citric Acid, Calcium Chloride), Cream* (Milk*), Concentrated Tomato Paste*, Cane Sugar*, Tapioca Starch*, Basil*, White Rice Flour*, Sea Salt, Roasted Garlic*, White Pepper*. *Organic Ingredients. This tomato soup is my favourite of all the Wolfgang Puck soups and I've tried them all!